Series 4000 Plössl 9mm Illuminated Reticle Eyepiece: The most advanced commercially-available illuminated reticle eyepiece, this Series 4000 Plössl 9mm model includes micrometric x-y positioning controls which greatly facilitate locking onto the guide star. Turn the finely-threaded controls and place the reticle's crossline pattern precisely at the desired position in the field. The sharp, high-power imaging of the 4-element, multi-coated Plössl optical system is complemented by a rubber eyecup (foldable for eyeglass wearers) that shuts out distracting stray light from the observer's eye. The upper (lens) section of the eyepiece rotates on a fine thread for precise diopter adjustment to the user's eye. Reticle pattern is a double crossline with two concentric circles. 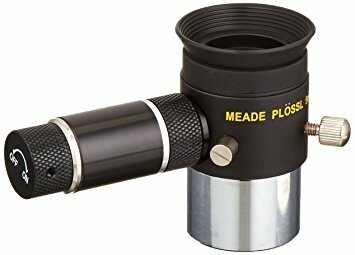 The Series 4000 Plössl 9mm Wireless Illuminated Reticle Eyepiece includes a red LED illuminator, operated from internal batteries, with variable brightness control. Batteries are included with each eyepiece.